Cook shells according to package directions. Drain and set aside. 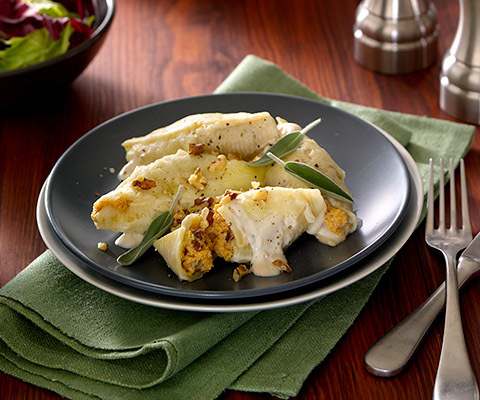 Spoon ½ cup of Classico® Creamy Alfredo Sauce evenly into bottom of 13x9 baking dish. In medium bowl, mix ricotta cheese, pumpkin, parmesan cheese, egg, walnuts, black pepper, sage, and 1 cup of the mozzarella cheese. Stuff each shell with cheese mixture and arrange in baking dish seam side down. Spoon remaining sauce evenly over shells. Remove foil and sprinkle remaining 1 cup of mozzarella cheese on top. Bake for additional 5 minutes or until cheese is melted and bubbling. Allow to rest for 5 to 10 minutes before serving.